Was born in 1851, and educated at Silcoates, Yorkshire, and the City of London School. He is owner of the s.y. Albion, 1,346 tons. This turbine vessel was designed by Sir W. H. White and built in 1905. 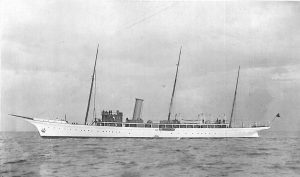 She ranks among the finest steam yachts in commission. Sir George is devoted to cruising, and spends much time on board his boat. Residences: 24, Carlton House Terrace, S.W. ; Hollerday, Lynton, North Devon.